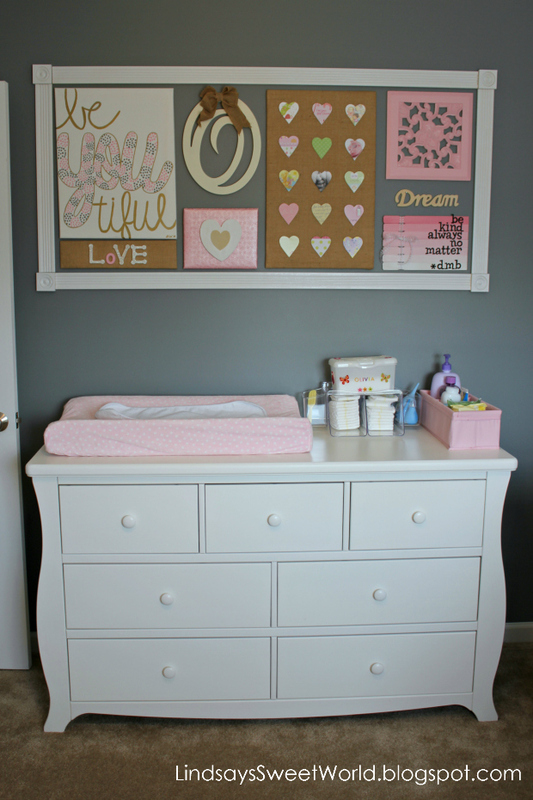 If someone had told me just a few years ago that I was going to paint my future baby girl’s nursery grey, I would have told them that they were crazy. 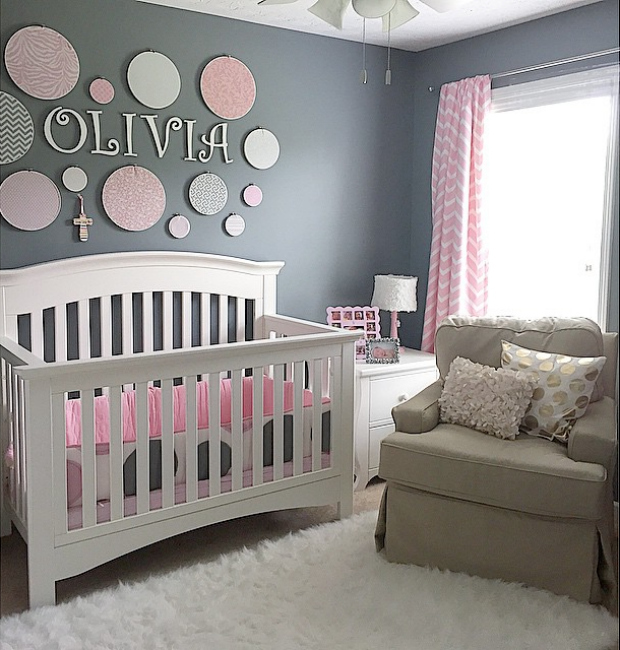 I had always pictured decorating in bright colors – preferably hot pink and lime green for a baby girl – up until I got pregnant with Olivia. I don’t know what made me change my mind after all those years, but I’m sure glad that I did because it turned out to be the calmest and sweetest room in the entire house. I'm also honored to mention that it was featured on one of my favorite blogs, Honey We're Home, for her HWH Loves Bloggers series last summer. You can see the post here. When starting out, we struggled to find the perfect shade of grey – I was worried about it darkening the room too much if we chose too dark, and I was worried about it looking too much like prison walls too white if we chose too light. There’s a fine line between an elegant grey and the depressing grey of menacing clouds in the sky on a rainy day. We brought home several paint chips from Lowe’s and pondered the decision for several days before settling on a shade from Valspar called "City Storm" (oh, the irony). And it turned out to be the perfect shade of grey. I wanted to find some pink and grey bedding to match, and I came across this bedding on Overstock.com and fell in love. I’m not a huge fan of elephants, but I knew that we wouldn’t actually use the crib blanket anyway. Does anybody ever use those?! 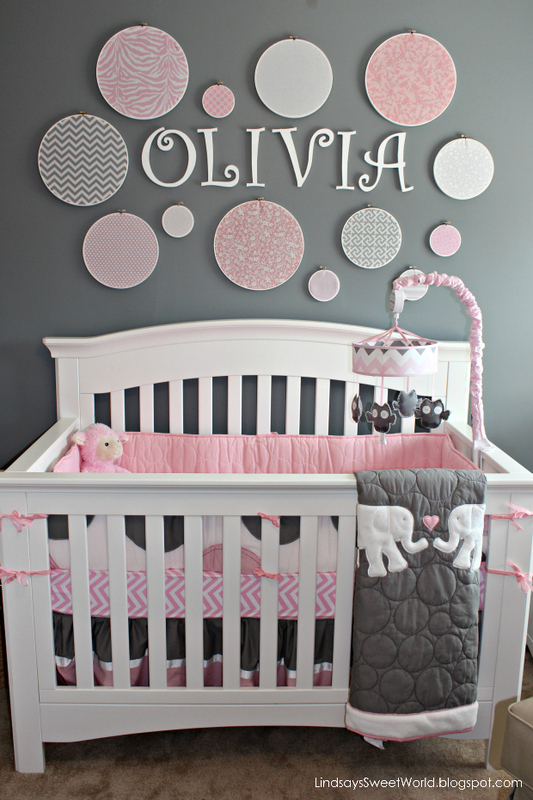 It was the polka dotted crib bumpers and ruffled bed skirt that I fell in love with… so feminine and beautiful. 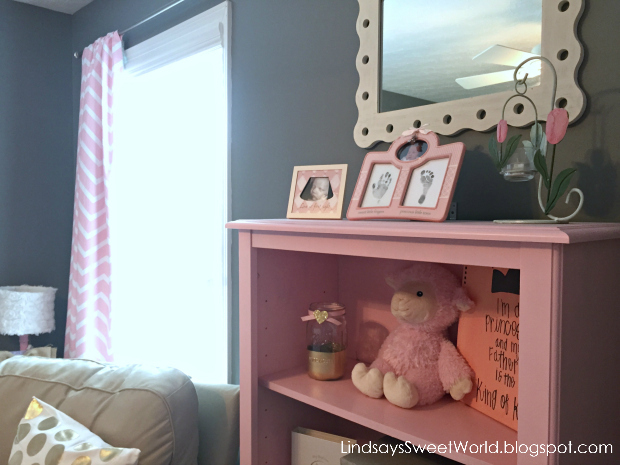 I knew that I wanted all white furniture for a baby girl because I always wanted white furniture growing up (mine was light brown), but I also wanted a pop of color somewhere in the room so the furniture didn’t look too matchy matchy. Enter Brian’s old childhood bookshelf. It was in perfect condition, and its outdated stain was screaming for a makeover. I bought a pint of Valspar paint in "Prom Pink" from Lowe’s, and there it was – the perfect pink. And it’s just so darn sweet that she’s using an old piece from Brian’s childhood bedroom. Décor – oh the fun that I had with the decorations! I think I scoured Pinterest for weeks for ideas! I had so many ideas that it took forever to narrow it down to just a few for her room. 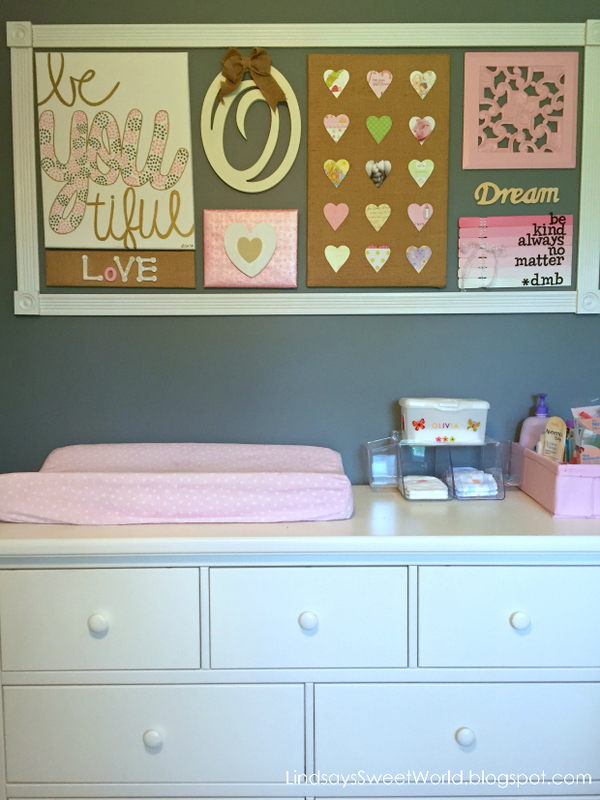 The grandest idea (and my favorite part of her entire room) is the wall over her crib. 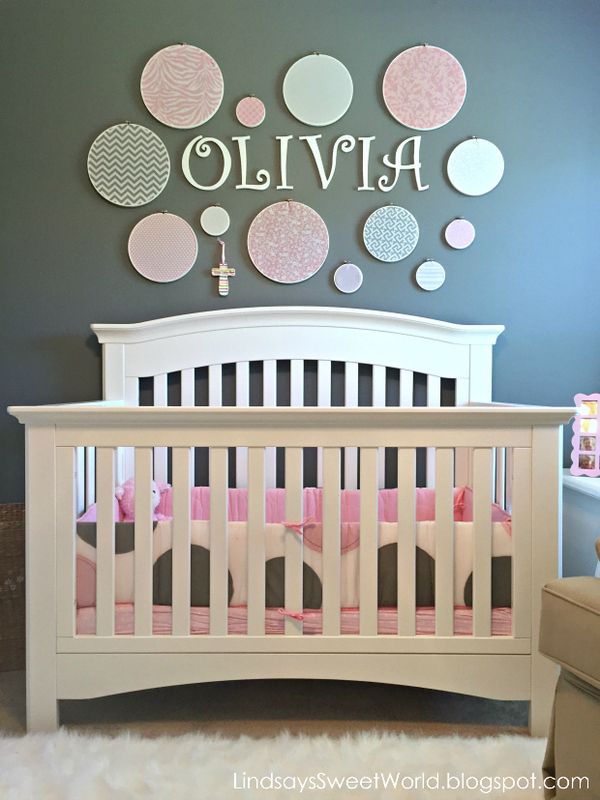 It displays her name in wooden letters that I purchased and painted from Michael’s, and it is surrounded by big polka dots in all different patterns and colors. This look was easy to achieve and it didn’t cost much either… I just purchased different sizes of embroidery hoops from Hobby Lobby and I filled them with fabric – some new pieces that I purchased as well as some old scraps that I already had on hand. The effect – stunning. I think this might be my favorite wall hanging in our entire house aside from my Daddy’s paintings. This piece was made from paint stirrers from Home Depot. I painted them hombre-style and then attached black letters from Hobby Lobby as well as some ribbon around the side. Voila! A custom piece for only a couple of bucks! This piece was made from a piece of scrap wood and some letters I found at Michael’s. 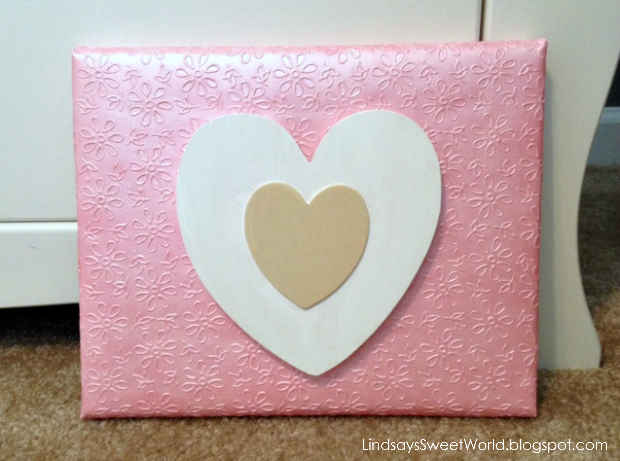 This piece was made from an old canvas, scrapbook paper, and wooden hearts, also from Michael’s. 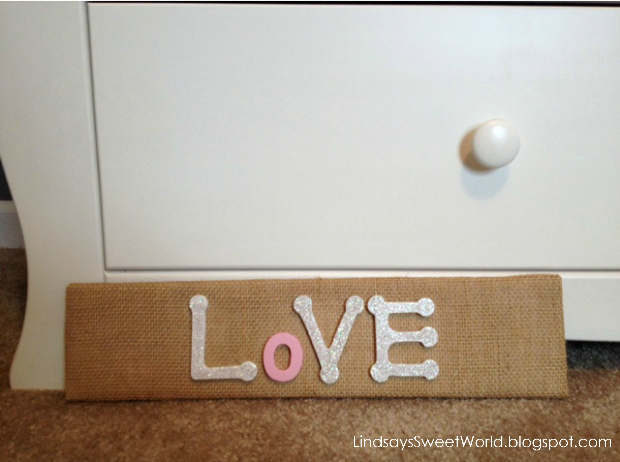 This piece was made from a piece of scrap wood, burlap fabric found at Joann Fabrics, and cards from Olivia’s baby shower. 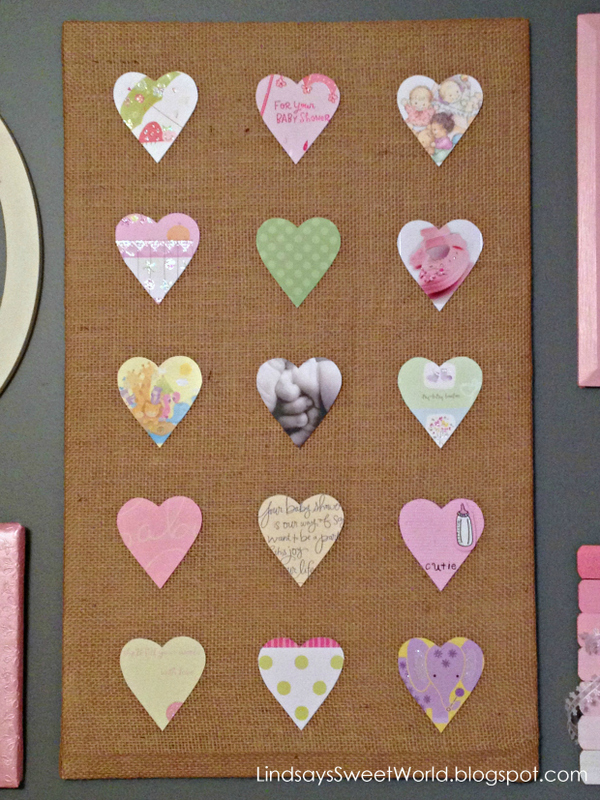 I used a heart stencil to cut out my favorite part of each baby shower card, and then I used glue dots to stick them to the burlap. Such a meaningful piece, and also easy on the wallet. Finally, this piece was hand-painted by me. 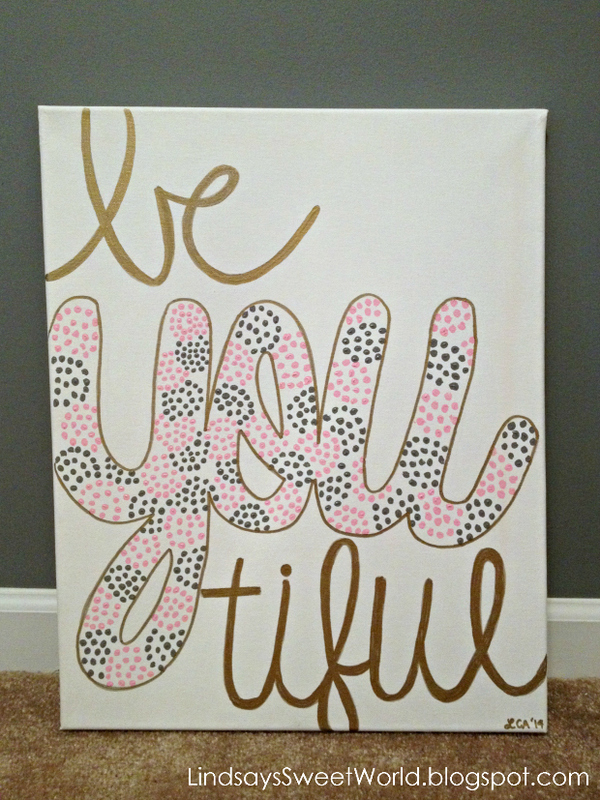 I had seen the phrase on Pinterest somewhere and I decided to make it my own to match her room. The remaining pieces in the gallery wall were purchased. 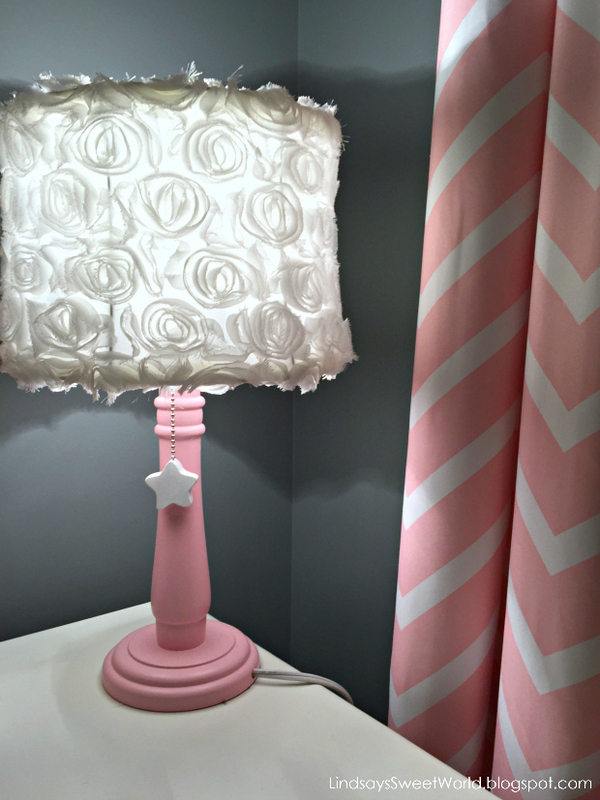 I also put together the perfect lamp for her room – I found an old white lamp at Goodwill for a couple of bucks, painted it with the leftover pink paint from the bookshelf, and attached a lamp shade that I had found on clearance at Hobby Lobby. Lamp perfection. 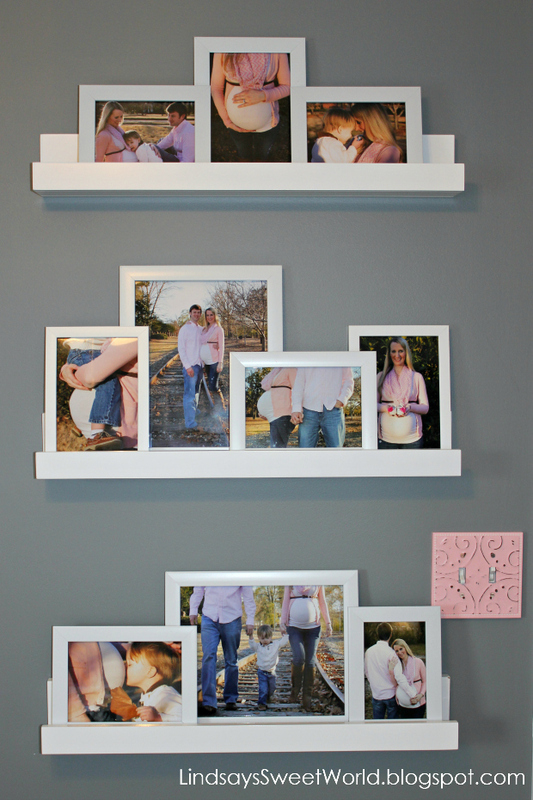 Finally, we had an empty wall between the closet and the door to her room, so I thought that it would be beautiful to hang some picture ledges containing pictures from her maternity shoot. The pictures can easily be interchanged as she gets older, and this is a wall that can grow with her for many years to come. 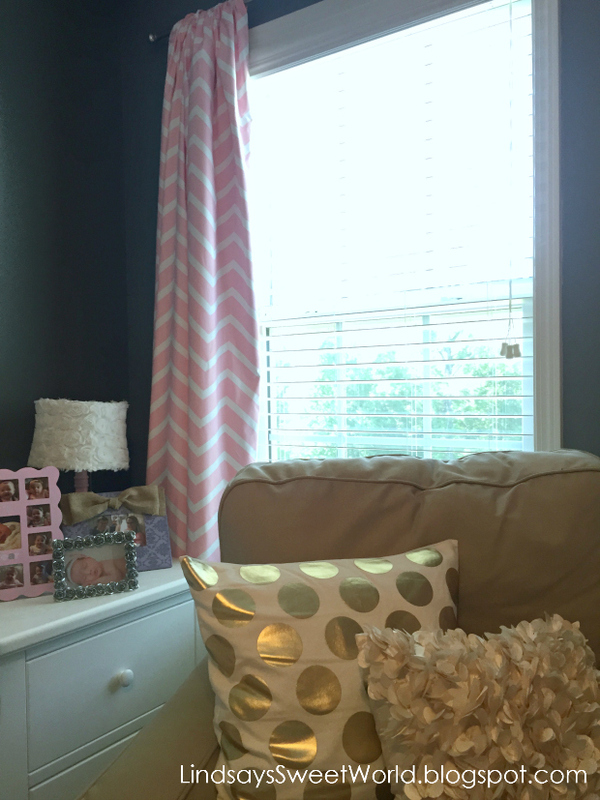 For the finishing touches, I sprinkled some pink and gold accents around the room – picture frames, trinkets, and pillows – and it was done! 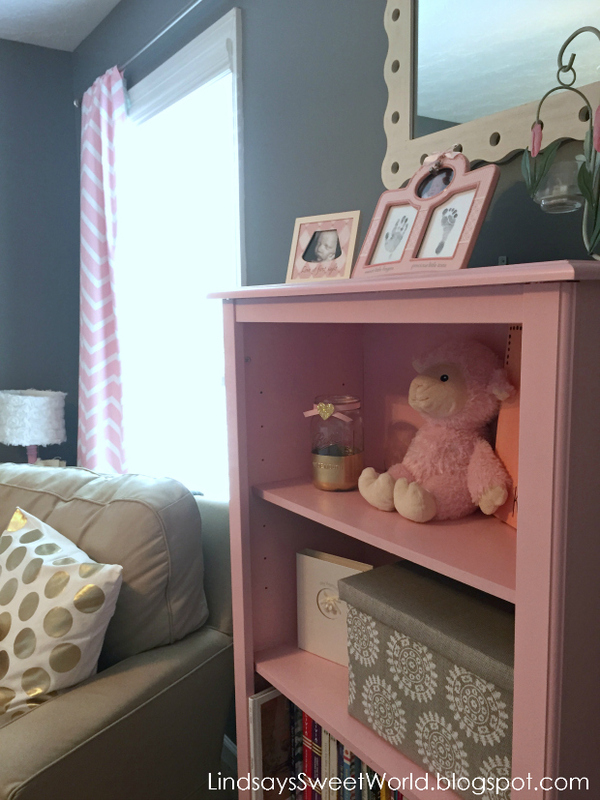 It’s the sweetest, girliest little space and it’s one that we won’t have to worry about redecorating for quite some time. Finally, just for fun, here are a few shots of the room when it was set for a newborn... just look at that sweet mobile! Oh, how I miss having a tiny baby! I hope you enjoyed Olivia’s little slice of heaven on earth! I’ll be back next week with the kids’ shared bathroom. And in case you missed any other rooms in the house, you can tour them below. 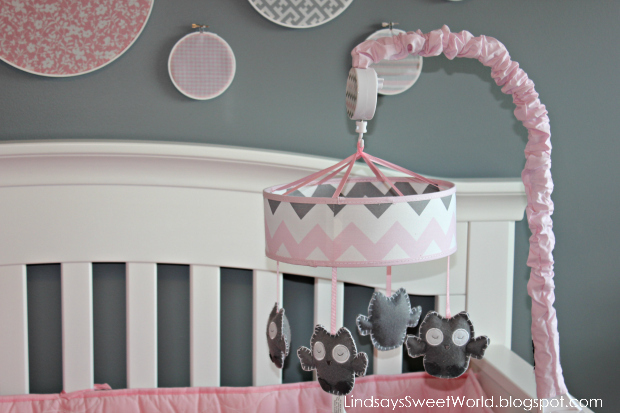 I love the embroidery hoops above her crib! I would have never thought of that--so cute! You're right, the colors in her room really are so calming! Pink & gray perfection! I love everything about Olivia's room. 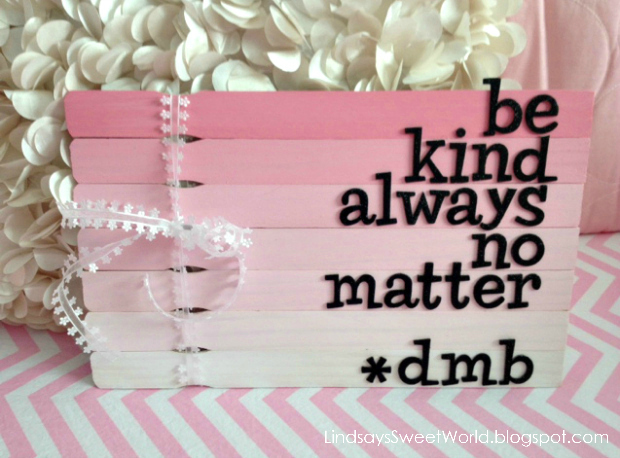 I was wondering if that DMB quote was on paint stirrers. That's awesome! My favorite is the wall above her crib, too. I remember seeing this pics a while back and remember how much I loved what you did with her room!! It is gorgeous!! 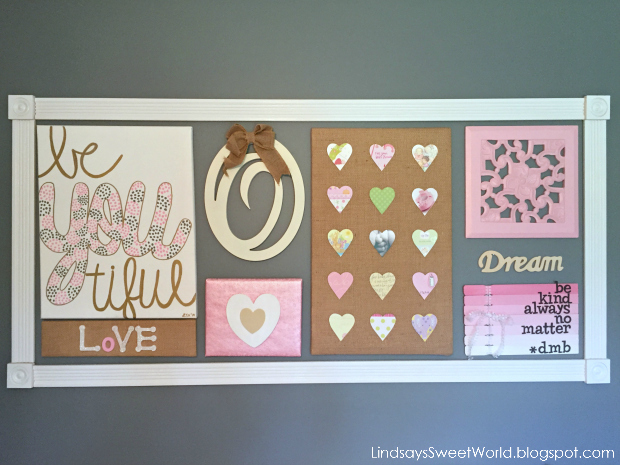 I love all of the DIY's you did for the gallery wall, so creative! Thanks, Lizzie! Thank goodness for Pinterest!! This room is so sweet! 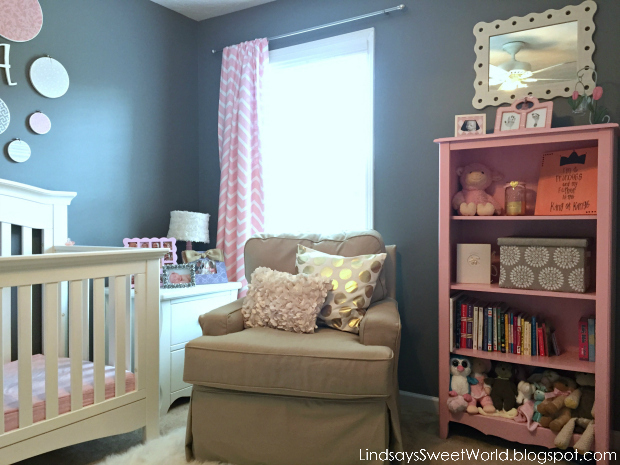 The pink and gray go perfectly together, and I love all the decor. 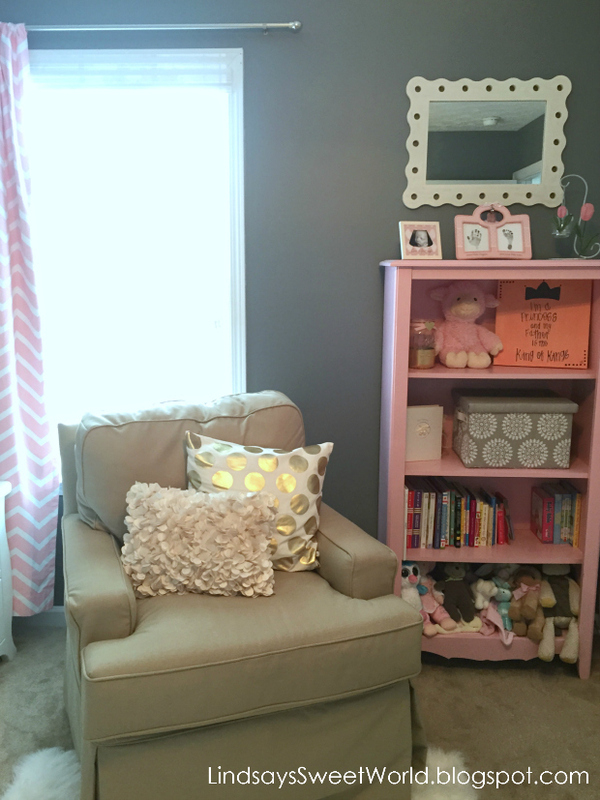 Perfect room for a little girl to grow up in! Beautiful! I agree, this room is so warm and inviting. I can imagine rocking a baby to sleep in this room and then tucking in a toddler for bedtime. It's a perfect transitional room. You're so talented and your home is gorgeous! I already can't wait for next week! Thank you, Marie! Don't get too excited, though... it's just the kids' bathroom next week. Lol. Such a beautiful room! 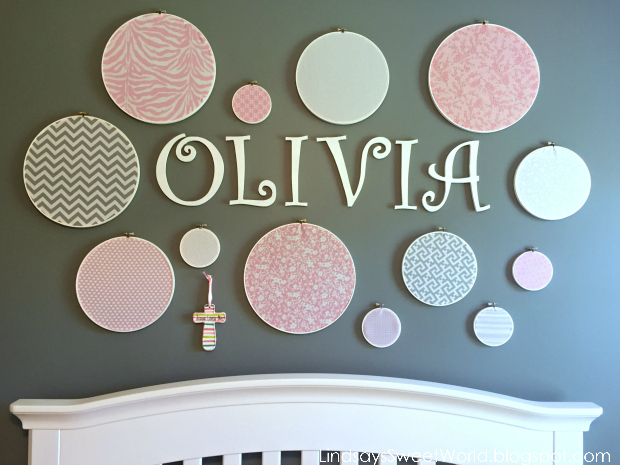 I especially love the fabric in the hoops that you put on the wall. Thanks for sharing! Thank you, Cat! Pinterest for the win! Oh I love it! Grey and pale pink look so great together! I think you chose the perfect colors! I also love the white furniture. I always thought I'd hate white furniture, but once we had all espresso stained furniture in Mila's nursery, I wished we had gotten white. Love, love, love all of the artwork as well. Where is the white rug from? 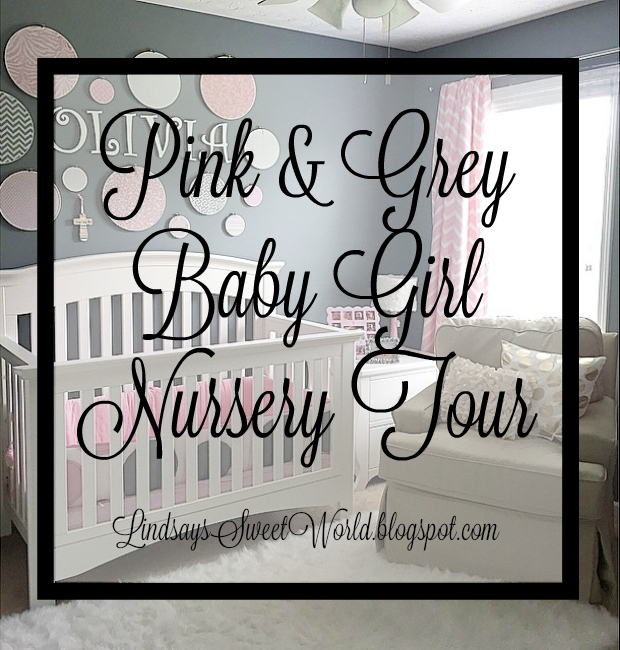 Oh my gosh, I absolutely love the gray nursery with pops of pink. All of the patterns are fantastic, too! Oh wow, her room is so sweet and perfect! I love the embroidery hoops!!! That is such a good idea!!!! I love her room. So darling. We are constantly still adding to the girls room. But I love it. We did pink and gold. But pink and grey were my wanted colors for our wedding. I lost that battle. Haha. I love her gallery wall and that you made most of it. I want to do the hearts out of the shower invites and some of the projects you did. 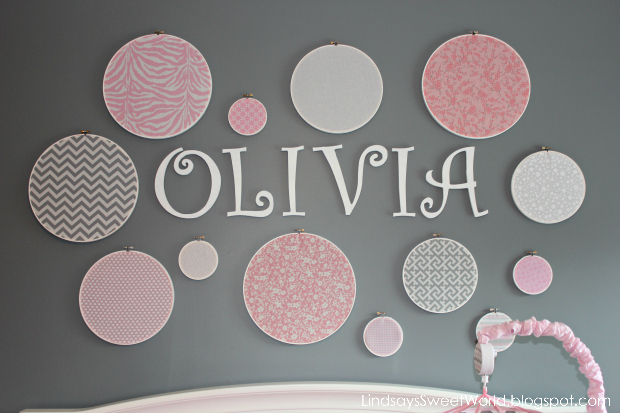 So cute and perfect for Olivia. Honey We're Home is one of my favorite, too! I definitely didn't put two and two together when I first read that post. So awesome! 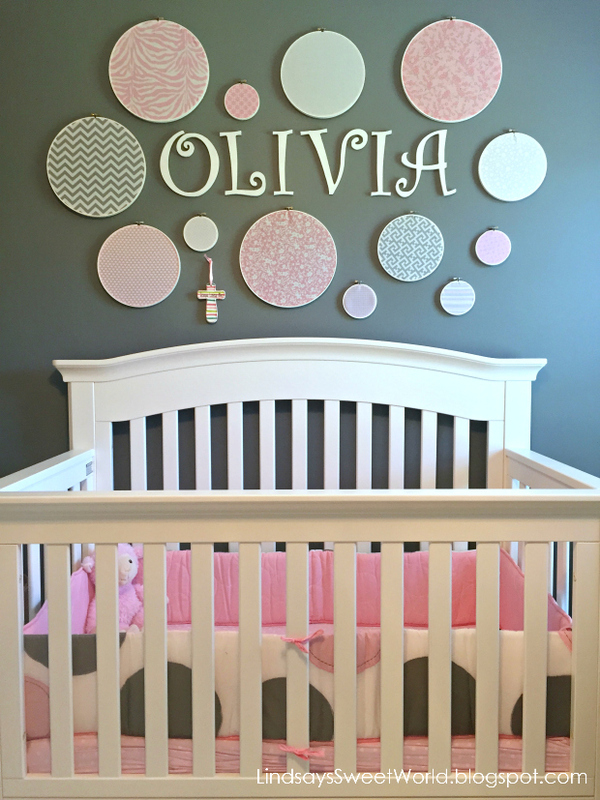 Just love above her crib...so creative! She has the cutest room. 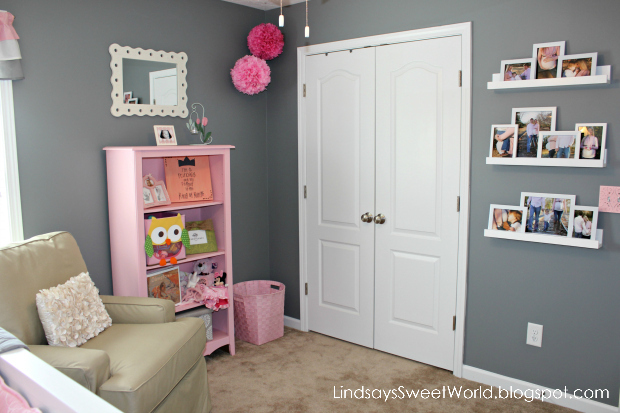 I love the gray walls and pink accents! And you have some serious DIY skills!! 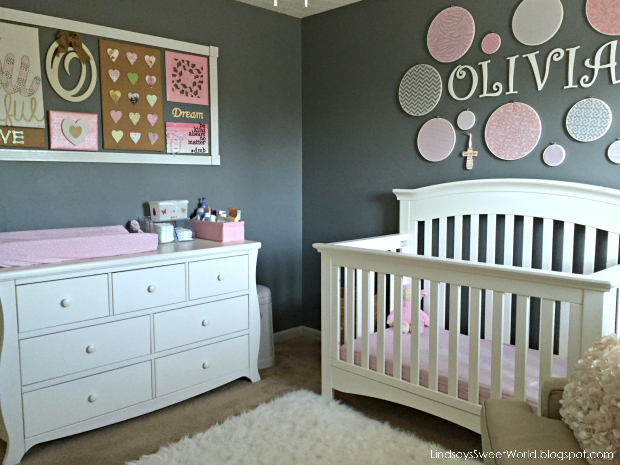 Olivia's room is absolutely beautiful!! Everything works so well together. 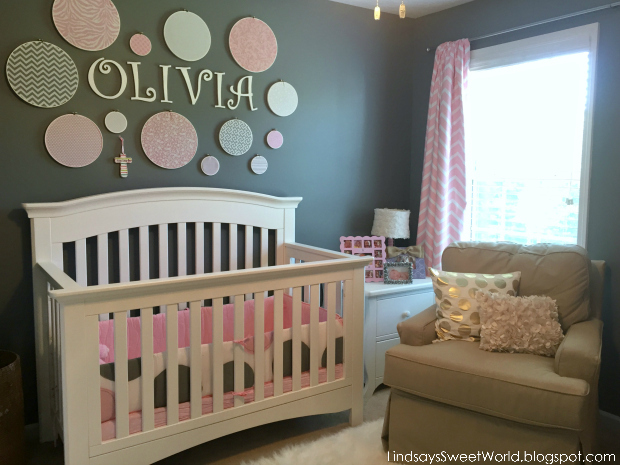 I love the wall behind her crib and the slight gold touches!! 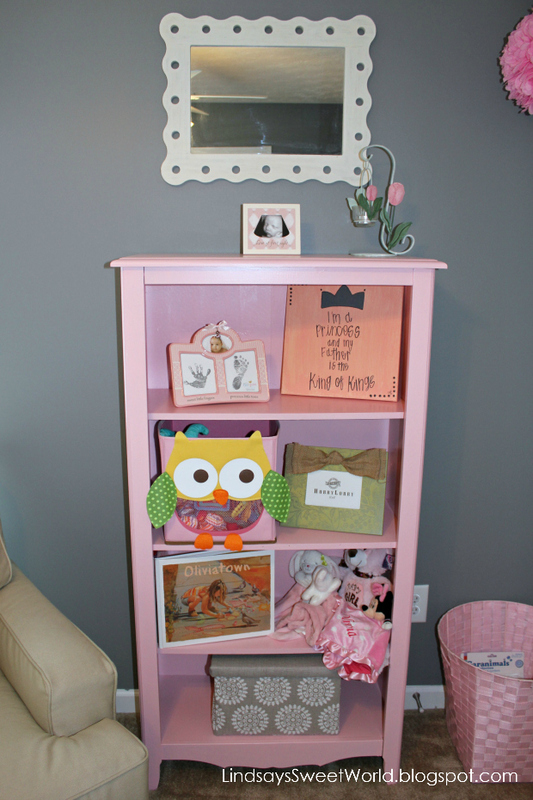 SO special her bookcase was her daddy's...I love that! Thank you, Jeannette, isn't it?! I've always been a girly girl so I was ecstatic when I found out that I was having a little girl! I love pink!